Are your Pets Ready for a Disaster? The key to survival during a disaster, crisis or emergency is to be as prepared as possible before the storm hits. Take the time to make a plan and assemble an emergency kit for you and your pet. 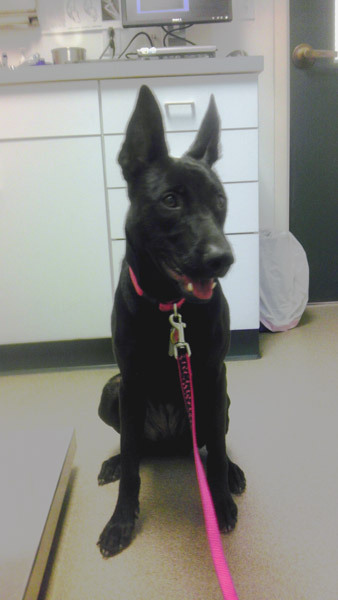 By taking these steps now, you will greatly increase your pet’s chances of survival. Make sure the neighbor knows your pets’ whereabouts and habits, so they will not have to waste precious time trying to find or catch them. Get your cats and dogs used to being in crates and carriers. Feed them in their carriers so they associate it with something positive. Create a pet emergency/disaster kit and place it in a prominent place where your neighbor can find it. Include pet medications or list their locations and instructions on how to use them inside the kit. Every member of your family should know what he or she needs to take when you evacuate. You also need to prepare supplies for your pet. Stock up on non-perishables well ahead of time, and have everything ready to go at a moment’s notice. Keep everything accessible, stored in sturdy containers (duffel bags, covered trash containers, etc.) that can be carried easily. If you reside in an area prone to certain seasonal disasters, such as flooding or hurricanes that might require evacuation, create a kit to keep in your car. Medications and medical records stored in a waterproof container and a first aid kit. A pet first aid book is also good to include. Cat litter box, litter, garbage bags to collect all pets’ waste, and litter scoop. Sturdy leashes, harnesses, and carriers to transport pets safely and to ensure that your pets can’t escape. Carriers should be large enough for the animal to stand comfortably, turn around and lie down. Your pet may have to stay in the carrier for hours at a time while you are away from home. Be sure to have a secure cage with no loose objects inside it to accommodate smaller pets. These may require blankets or towels for bedding and warmth, and other special items. Current photos and descriptions of your pets to help others identify them in case you and your pets become separated and to prove that they are yours. Information about your pets’ feeding schedules, medical conditions, behavior problems, and the name and number of your veterinarian in case you have to board your pets or place them in foster care. Other useful items include newspapers, paper towels, plastic trash bags, grooming items and household bleach. Because evacuation shelters generally don’t accept pets (except for service animals), you must plan ahead to make certain your family and pets will have a safe place to stay. Don’t wait until disaster strikes to do your research. Contact hotels and motels outside your immediate area to check policies on accepting pets. Ask about any restrictions on number, size and species. Inquire if the “no pet” policies would be waived in an emergency. Make a list of animal-friendly places and keep it handy. Call ahead for a reservation as soon as you think you might have to leave your home. Check with friends, relatives or others outside your immediate area. Ask if they would be able to shelter you and your animals or just your animals, if necessary. If you have more than one pet, you may need to house them at separate locations. An evacuation order may come, or a disaster may strike, when you’re at work or out of the house. Your pet should be wearing up-to-date identification at all times. This includes adding your current cell phone number to your pet’s tag. It may also be a good idea to include the phone number of a friend or relative outside your immediate area—if your pet is lost, you’ll want to provide a number on the tag that will be answered even if you’re out of your home. The single most important thing you can do to protect your pets is to take them with you when you evacuate. Animals left behind in a disaster can easily be injured, lost or killed. Animals left inside your home can escape through storm-damaged areas, such as broken windows. Animals turned loose to fend for themselves are likely to become victims of exposure, starvation, predators, contaminated food or water, or accidents. Leaving dogs tied or chained outside in a disaster is a death sentence. If you leave, even if you think you may only be gone for a few hours, take your animals. When you leave, you have no way of knowing how long you’ll be kept out of the area, and you may not be able to go back for your pets. Leave early—don’t wait for a mandatory evacuation order. An unnecessary trip is far better than waiting too long to leave safely with your pets. If you wait to be evacuated by emergency officials, you may be told to leave your pets behind. Bring your pets indoors as soon as local authorities say there is an imminent problem. Keep pets under your direct control; if you have to evacuate, you will not have to spend time trying to find them. Keep dogs on leashes and cats in carriers, and make sure they are wearing identification. Planning and preparation will help you survive the disaster, but your home may be a very different place afterward, whether you have taken shelter at home or elsewhere. While you assess the damage, keep dogs on leashes or in crates and keep cats in carriers inside the house. If your house is damaged, they could escape and become lost. This is wonderful for introducing a dog to the wonders of his nice safe den, the crate! step 1. 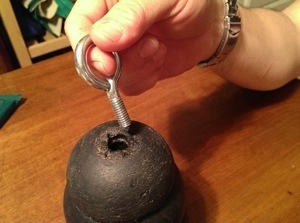 Put eye bolt through the small hole in the kong. 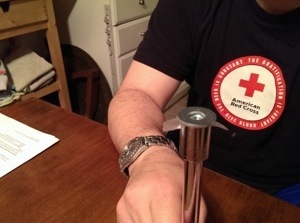 Step 3 Put nut on top of tape and push the nut and tape into the socket. Step 4 Place washer over the end of the socket wrench pressing firmly on the tape sticking out of either side of wrench. 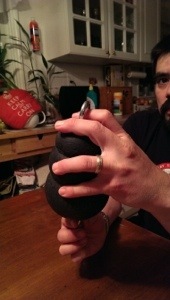 Step 5 Place middle finger through eye bolt and pick up kong with big hole facing down. 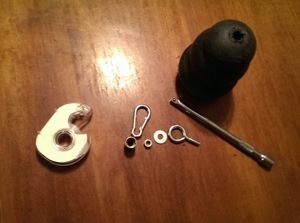 Step 6 Put socket wrench through the hole in kong. 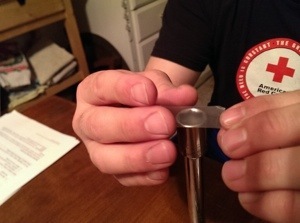 It helps to find the bolt by aiming for your finger through the eyebolt on the outside of the kong and gently feel for the bolt. Step 7 Tighten the nut until finger tight. Don’t tighten too much! Step 8 Attach carabiner to the eye hook. Step 9 Stuff the kong with peanut butter, wet food, kibble, cheese, or other goodies. You may even freeze to make it last longer. Step 10 Attach the kong to the back inside of the crate near the bottom so the kong is laying on its side. In order for your dog to have the kong he must be inside the crate. Start with the door open the entire time. After many days you may close the door for longer and longer periods while you dog is enjoying his kong. This dog can do anything! 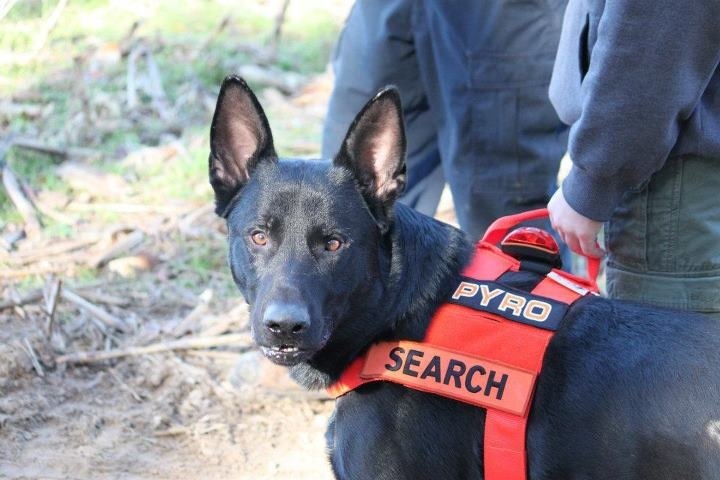 Pyro is a dog on my Search and Rescue team that does it all. He can climb anything, find anything, do pretty much anything. Right now he is need of some help. For some unknown reason, he has developed an infection that is costing his wonderful handler a bit of cash and a ton of heartache. She will do anything for this dog, and this dog will do anything for her. 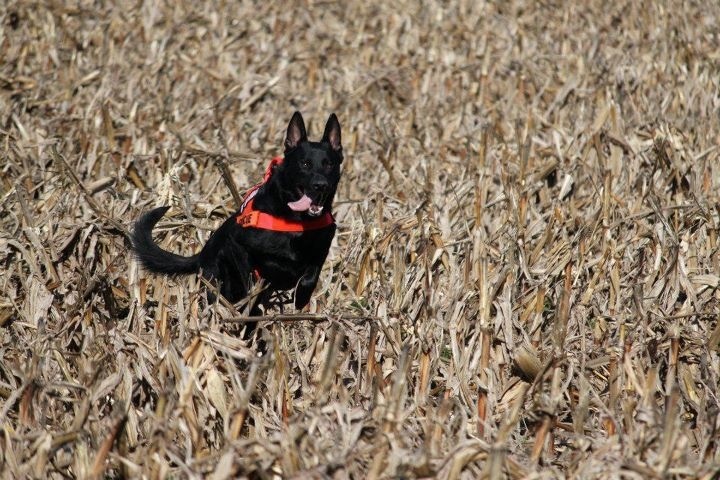 HIs handler/owner is broken to pieces over this boy and she will not give up. Long time readers know I do not post about charities on this site. This dog is special. If you can only give a dollar, go for it. Nothing is too small. If you cannot give a dime, spread this post around. Maybe someone you know can give something. Pyro has done so much to help humans. We can do something to help him. Find his story and Donate now at the link below. We tried everything. We threw his favorite toys in the water. We threw other dog’s favorite toys in the water and he watched those dogs swim for them. We threw Grom’s favorite toys in the water and let other dogs swim for them. I got in the water and teased him with his favorite toys. I got in the water, put a life vest on the dog, and helped him “swim,” through the water. We did everything short of just throwing him in to the water. No matter what, he would only get to the point where his feet stopped touching the bottom. Then, he stopped going any further. He never really liked to swim. All it took was his best friend in the whole world, a lab named Seamus, to go swimming. There must have been a doggie conversation between the two, because after Seamus went out, so did my dog! Did you catch the little dog in the lifejacket? That’s right, it is little Mo! She loves to swim! Of course she really enjoyed biting the waves and digging in the sand too. What a great day on the water. Woo Hoo!